Surrey-based Stocksigns Group has developed a range of various signage solutions for the winter months to tackle extreme weather conditions. Stocksigns provide a wide range of affordable ice and snow signs which can be produced on 1mm rigid plastic, 22swg (0.75mm) aluminium or self-adhesive vinyl to encourage drivers and pedestrians to be more aware of their surroundings in extreme weather. 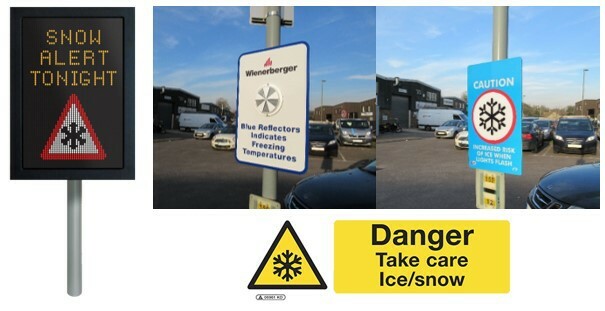 Stocksigns' range of temperature reactive ice warning signs are suitable for car parks. The signs are available in two models; an LED model with flashing blue lights in icy conditions, and a reflector model which turns from grey to blue to warn of possible icy surfaces. On a larger scale, Messagemaker Displays, a subdivision of the Stocksigns Group who specialise in LED signage, has developed a full colour fixed variable message sign (VMS), which displays the latest traffic information to motorists on roads and highways in real-time. This allows road users to know of occurrences such as road closures, queues ahead and upcoming events.